Top Gear is looking for a new presenter to work with the already announced Chris Evans. 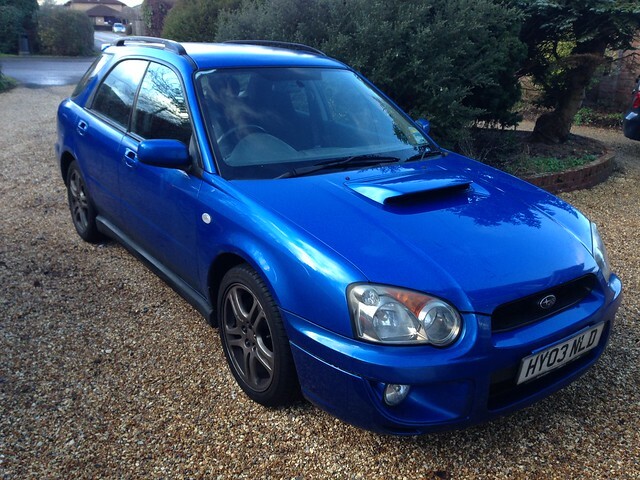 They want someone interested in cars, obviously, and someone who can work on screen and deliver interesting things. I suspect they also need someone up for some more unusual stunts and gags. At this point I raise my hand and say pick me! pick me! I have always loved cars, watching them, driving them and as the technology has evolved, racing in simulations of them. Being a tech evangelist and geek I think I am in a very good place to understand and share all the new advancements in how we propel ourselves around the planet too. 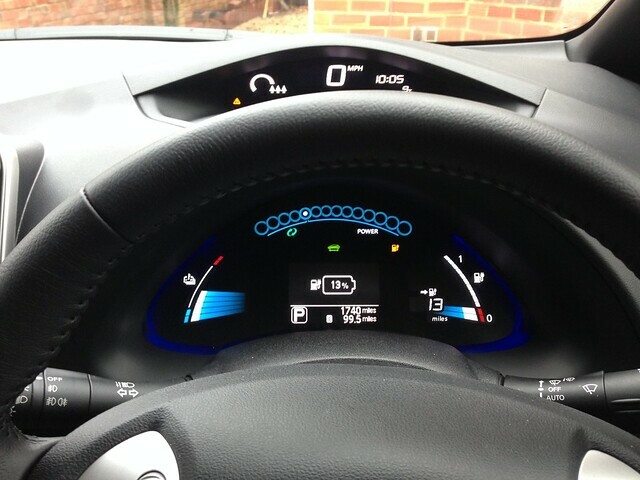 The world is changing and the internal combustion engine, whilst amazing and fun, is on its way out. On the TV show I presented on (oh yes I have some TV experience 😉 ) I shared the hydrogen fuel cell approach to moving things around. It is fascinating. I also got to do a piece on the Bloodhound world land speed record car. Innovations in evaporation to power movement and even osmosis to generate electricity are appearing. Not to mention my other favourite subject 3d printing. The ability to make parts or entire vehicles from rapid fabrication is a game changer. With all the things I share and evangelise I feel I have to be doing them, and living them to make sense. 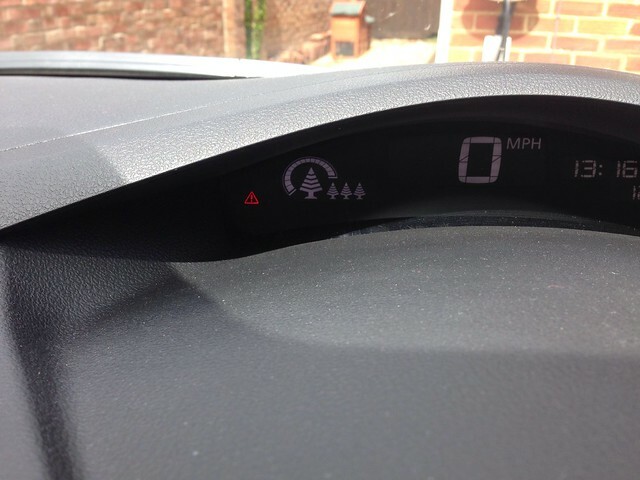 I recently said goodbye to my much loved Subuaru Impreza WRX in favour of the ultra hi tech all electric Nissan Leaf as I wrote about here. There is also, as I mentioned at the start the entire gaming and simulation world of cars. On Cool Stuff Collective we visited a full on simulator. I jumped in and got pretty decent times despite being thrown around a lot. Then there are the home platforms to race and custom cars. Forza, Project Cars et al. 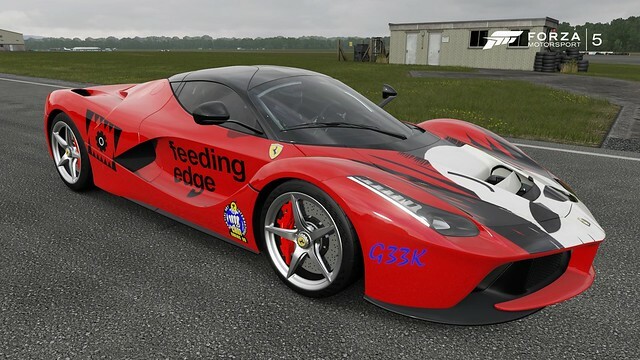 I have been making custom paint jobs for these stunning models and driving them around at speed. Most recently in Project Cars but roll on Forza 6 and the new Trackmania. It’s not all simulations and ideas, sometimes you just have to drive as here on a track day experience in a “Lamborghini LP640 Murcielago, all smiles. I will of course be looking forward to where and when formal audition process starts. Here is the quick less than 30 second video as per the suggested rules. The official site will be up tomorrow for the world to apply, but it seems a pity to wait. Good luck to whoever gets the gig I am sure it will be awesome. Free roaming role playing games are one of the most intriguing style of games and experiences to engage with IMHO. I use the word experience, not just games, in order to encapsulate the social environments and metaverse’s such as Second Life, Hi Fidelity et al. However I also did not just restrict that first sentence to include online massively multiplayer/multiuser online. 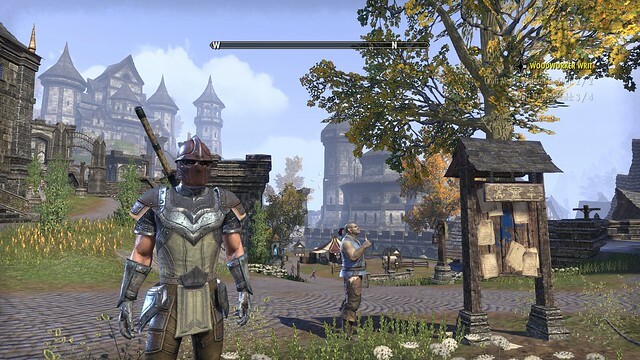 There have been two significant release the past few weeks that are both huge expansive free roaming role playing games The Witcher III and Elder Scrolls online – Tamriel Unlimited. . I have been struck by a few experiences that I have had in these environments. Ones that reach past just playing a game or getting some points/gold/kudos/screenshots. If you are not a gamer, or don’t engage with these sorts of things they may seem almost identical. They are certainly in a genre and have lots in common. 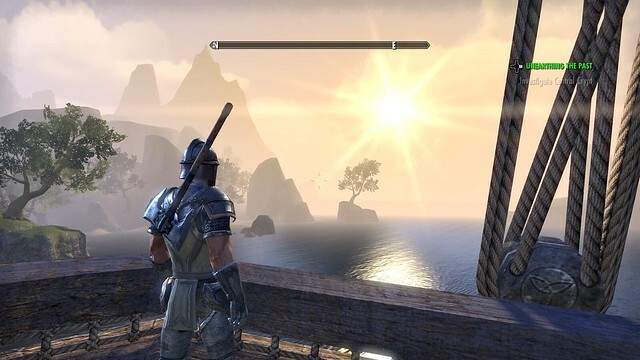 As you can see in both you are able to take a break from any action and just appreciate the environment. This is not intended to be a graphic comparison though the slightly different styles, yet still aiming for the “real” is noticeable in these two examples. Witcher III is a single player game. It is a story driven plot. A very long story it would seem too. Like all role playing games it rewards your play with new skills, levels and abilities as you level up. You gradually unlock the very expansive world with all its challenges and new types of monsters and bad guys as you progress through the main storyline. This generally involves traversing the world searching and fighting in various ways. It has a 3rd person style of free form combat. You choose the type of weapon and various potions and armour to give you a fighting chance against increasingly higher level creatures. You can just wander off the plot and the beaten track and see what you bump into. However this particular RPG reminds you constantly that whilst you might feel you have learned a lot there is still more levelling up to do as you arrive at a place in a world full of things that can cut you down with a single strike. Level systems in RPG’s generally appear as numbers on the display. When you have spent 20 hours playing and just reached level 7 and you wander into a clearing with a large beast that says level 35, where level progression is non linear and requires exponentially more effort and time per level you know you are in trouble. Witcher reminds you that no matter how heroic and skilled you thing you are, there is always something bigger and better. It has a grittiness to the entire game that brings a sense of foreboding, yet it is still entertaining. However you are very much alone and left to your own devices. 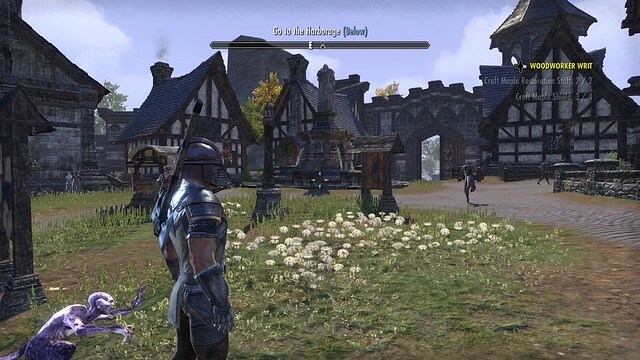 Elder Scrolls Online – Tamriel Unlimited is a very different feel and a very different experience. It is Skyrim (the one player RPG from a few years ago), reborn into a persistent Massive Multiple Player Online experience. Skyrim had been noted for it’s random generation of dungeons combined with its epic land size and the variation of things that you ended up doing in the virtual environment. 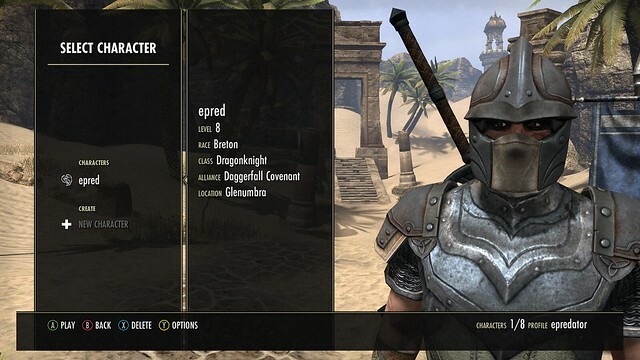 Elder Scrolls has both a 3rd person and a 1st person view. The latter lets you see the world, and just your hands/ weapons. It lets you use each and on its own, weapon and shield combinations. The weapon can be ranged magic in one hand and a sword in the other. You travel the world finding missions from non player characters. Most of these involve collecting, running to and fro and just like the Witcher III putting things together and crafting items you need, potions, armour, magic, food etc. 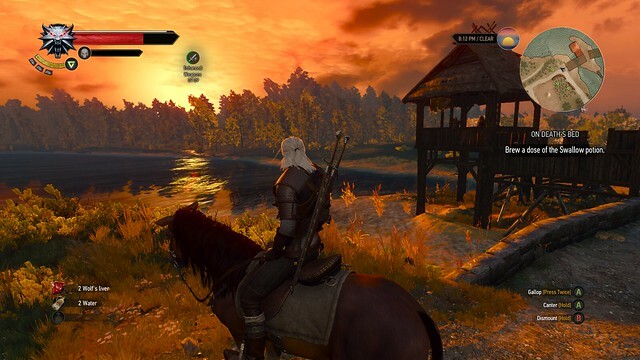 So unlike Witcher III your character is in the environment with lots of other people. Just like the other giants of the MMORPG genre, World Of Warcraft and Eve Online. It is quite unusual for this sort of genre to make it to a console. Usually these platforms get multiplayer shooters where 16-32 people battle for a few minutes in an arena that is then destroyed and reformed for the next battle. Here we have a world that we all share, all the time. Of course the technical detail of which server, or how anyone is actually in the “same” place is obscured and not entirely relevant to the experience. Also the world itself is generally a locally loaded place. The servers are there to broker player position, communication and hold certain shared features in the experience, but it is not really a full persistent world. I have found it works really well as a game to be wandering around, getting engrossed in each task, gradually levelling up, choosing skill tree paths, working out what to carry, sell, deconstruct and to craft. Lots of the missions from the non player characters are actually there to help you learn the very complex system of crafting as much as forwarding any plot line points. Choosing missions chooses various guilds and organisations to which you belong. I called this post “alone in the crowd” because it is a particular feature of this style of environment that you do see lots and lots of other people, milling around playing their own missions, but you do not have to interact with them if you don’t want to. Though sometimes it is unavoidable, or required to work in a team. This is by no means a crowd shot! but the character not the right is just running off somewhere. They ran past me, I paid no attention to them, nor them to me other than we just both know we are part of the human noise of this virtual city. Most things are not restricted based on numbers in the free roam areas. 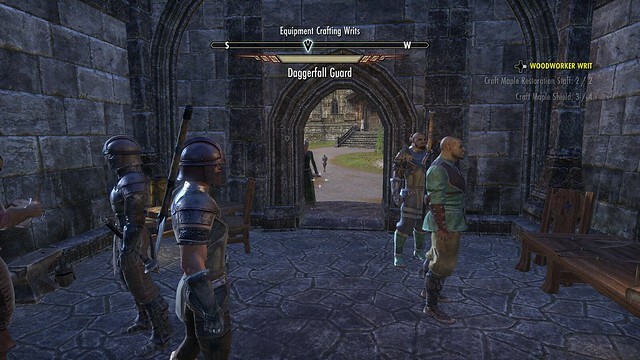 For example the blacksmith station is a object you have to walk up to, select and then take part in an inventory management/crafting dialogue. The things you are doing are entirely related to you and your experience, but we all have to gather around the anvil in order to do this. This is good when there are only a few people, but when it’s busy the room is full of lots of gormless characters standing around. This is a feature of most virtual world online experiences. The only time it is not is when people are more seriously role playing and rules are set to preserve the experience. 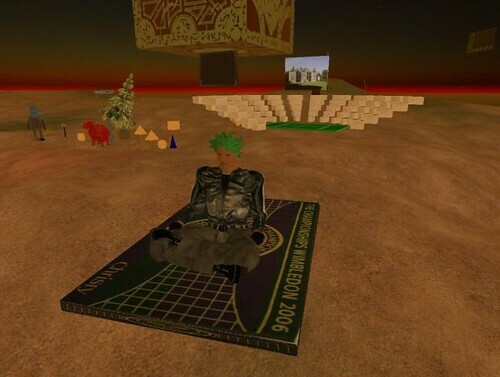 This happens in some areas in Second Life where you are encouraged to be wearing the right clothes, speaking the right way to join in with the entertainment of acting. Rather like not turning at a real life roman re-enactment on a segway wearing a stetson. That is not to detract from the game, or games like it. This is a genre where stuff like this has to happen due to the way the tech works, but also the way people work. It is funny, but it can be a jolt in the immersion. Where this sharing of space does work though is in battles with things in the environment and things in it. You can be wandering around exploring and then be set upon by a pack of wolves. When you start fighting it becomes “your” battle. However other people passing by can also see and join in with that battle, or choose it ignore it. Those wolves become a shared experience. There are a lot more bad guys than wolves but it’s an easy example to use. For a short period of time, you and the others who just happen to be there at the time are no longer alone. You are working with the same problem. Now this could just be thought of as a few experience points of resources to add, share split, ignore but it has all sorts of extra dynamics. If you see someone in trouble, do you help ? Does your helping actually hinder and annoy them? as they were challenging themselves and their character. Sometimes you just have to join in in order to be able to get the things you need to proceed. In one particular example the bits of a monster were needed in order to escape an area. If someone else kills the monster before you get any sort of hit in then you are not credited with any part of the kill so do get the bits you need. This meant waiting, or searching for another one of the same type, waiting for a re-spawn and getting in there before the rest of the crowd. Game design and rules may have altered how many people might be competing for this single resource, and I did escape, but it was an interesting co-opetition dynamic. This led also to another thought on timelines, on the immersive experience and how we are often reminded of our place in these virtual worlds. Having worked towards a small piece of the plot and defeated a particular boss, whereby a slight levelling occurred, new kit and a small buzz of excitement at having completed something, whilst standing near the same spot taking stock a new crowd arrived. Of in the distance I heard the bad guy arrive again, go through the same “No mr bond I expect you to die” style of dialogue. 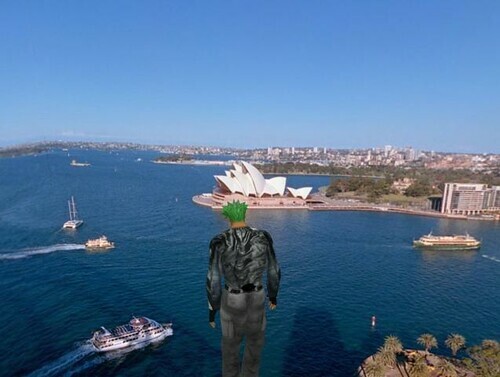 I watched from the distance as my fellow travellers and gamers fought the same battle, but in a different way. In my timeline, this battle was over. I was stood in what was attempting to be a coherent virtual experience being reminded I was not. It is not a problem, as such, but it is a thing. It is reminder and a breaking of the story. Yet I think there may be something in this kind of feeling of immersion and then shocking back into reminders it is not real. It is an accident of the technology restrictions that cause this to happen. It is a technique used in other media when the action breaks the plane to the fourth wall. When a stage actor talks to the audience when previously the audience were passive. Some of the most chilling of these have been Kevin Spacey in House of Cards. The very occasional, to the point you think they have forgotten to write any in, turning to the audience and engaging in dialogue is very special. One of the most memorable being “Oh did you think I had forgotten about you?” still gives me goosebumps thinking about it. It should not matter if we choose to form clans and take on multiplayer missions, or just act on our own in these worlds. The very mechanism we are using has the ability to reach back out to us and surprise us. I have felt this in games just a few times. It may be a party trick in some cases but reaching out to the human, through the role play, through the immersion may just be the most memorable and entertaining thing a virtual world can do. This may be a bit late to one of the party but @elemming and I have got ourselves Fitbit Flex HR wearables. This little devices track all sorts of walking movement, sleep patterns and most importantly heart rate. The idea is you wear them all the time and aim to do 10,000 steps a day. I was more interested in the heart rate monitor though and what it meant to my Choi Kwang Do training. Whilst this may stray into exercise bore territory I though it worth showing our martial art in internet of things (IOT) terms with some nice graphs. It is easy when devices and numbers are in place to over fixate on the numbers, but it makes sense to use instrumentation as a check and balance for your own personal experience. The last few weeks I have ramped up my training at home, having practiced this art for 3 1/2 years I am still very much learning, but I do have a body of experience to draw upon and some degree of consistent feeling to how particular techniques are going to how much extra I can put into a pattern or speed drill. I have used heart rate monitors before. I used a chest strap one about 18 years ago when I had a little burst of getting fit. (That’s part of the article in may portfolio piece virtual athletes – Sports Technology and games). It was where I came to understand it the different heart rate zones based on age. 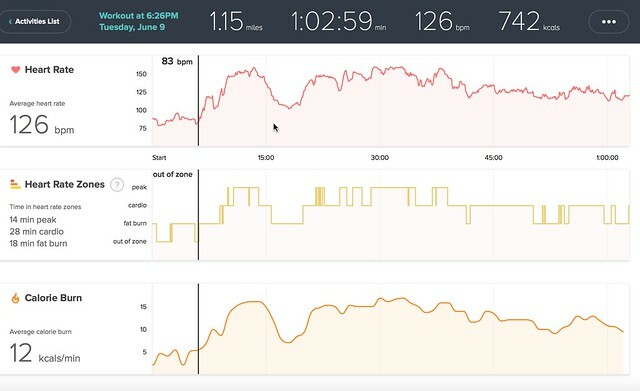 I had considered other sports wearables, the Apple Watch was a little to expensive, and other people we knew had fitbits so it added to the game side of things with leaderboard and comparing data. 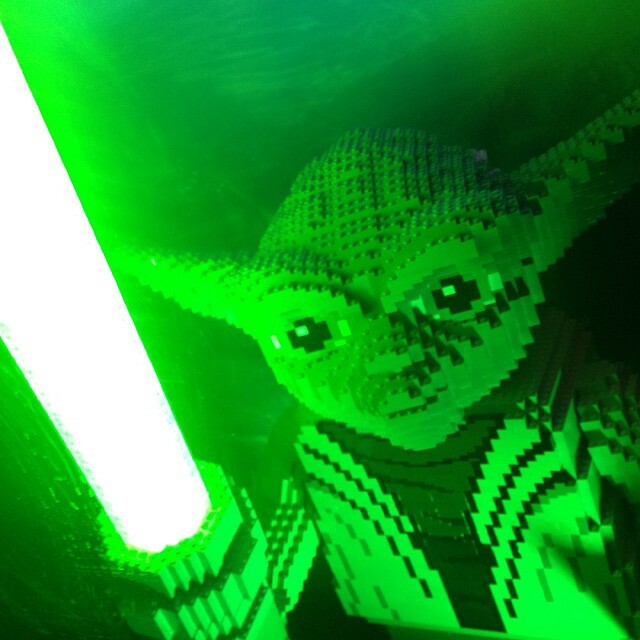 Yesterday was the first half of a day with it, I had already done 1 hour of Choi in the morning so missed that session. Just before our full class at Basingstoke I did a 17 minute warmup and PACE drill at home. This involved around 5-6 minutes of stretch. Then 2 minutes of moderate pace punching and kicking on BOB, 2 minutes rest, 1 minute faster harder pace kicking only, 1 minute rest and then 30 seconds flat out with everything. I then warmed down a little with my current combination. The trace of the heart rate certainly fits the level of work and where I felt I was with my heart rate. PACE drills (Progressive Accelerated Cardio Exertion) is a high intensity short burst training method gradually extending and layering your range. We train for speed and power in short bursts as part CKD rather than long repetitive exercise. The class session ended up as a very intense one too. We have a number of soon to be black belt students in their run up to a grading. So for the lesson I joined them to do our entire set of patterns. This is around 8-10 minutes of going through each coloured belt curriculum pattern. The pattern is a defined set of movements that build techniques up and up. We can all do this at a good steady pace to maintain the form and technique. After that we had a specific blackbelt recap and evaluation of our current belt. That involved current hand techniques, current kicks, combination and pattern. This then ended with a very high intensity PACE version of the speed drills. This are what they say, fast defined sets of moves. We each had a slightly different set but performed them at the same time. We did inaccessibly fast and multiple sets with a final full on blast at the end of one set flat out (when already feeling flat out). The class then went on with both shield drills and focus mits. As you can see the initial ramp up is the start of the patterns with almost no heart rate increase, then as it progresses the heart rate starts to climb. The trough after 15 minutes is the rest period before the black belt sets. The plateau at 125 from just before 45 minutes is when the speed is and power are still the same but the body seems to accept this is going to happen. This is when techniques flow the best. It is also when the effort is in holding the equipment for others and encouraging them. It shows the benefit of an intense PACE session soothing into learning mode and technique efficiency. My resting heart rate is showing at 64bpm after the exercise and sleep which is not too bad. 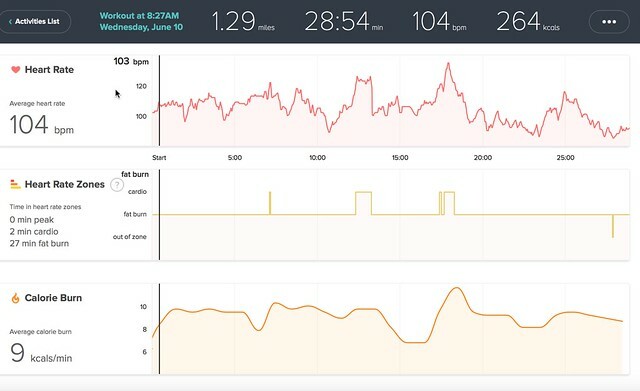 It shows how a nice steady activity, not over doing gets the heart rate in a comfortable fat but position. 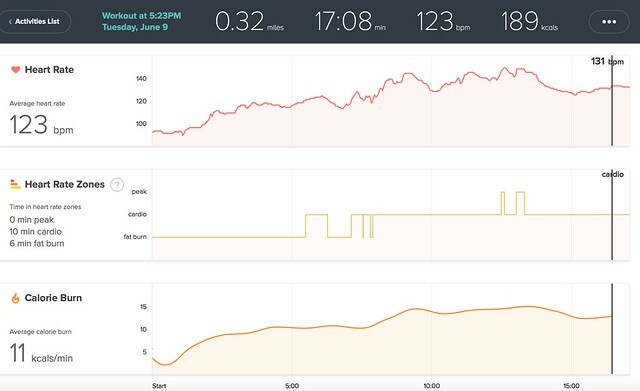 So armed with this information, and now with a reference point I can use the device to reflect on various elements of training and hopefully make my techniques better and more effective. With some improvements in the sensors that detect out body movement we should be abel to make some great strides in how specific body movements are delivered with great effectiveness but being mindful of the more pure nature of a martial art in just doing it and being in the moment. We are on the cusp of a huge change in how we as humans interact with one another, with the world and with the things we create for one another. A bold statement, but one that stands up, I believe, by following some historical developments in technology and social and work related change. The change involves all the great terms, Augmented Reality, Virtual Reality, Blended Reality and the metaverse. It is a change that has a major feature, one of untethering, or unshackling us as human beings from a fixed place or a fixed view of the world. All the great revolutions in human endeavour have involved either transporting us via our imagination to another place or concept, books, film, plays etc. or transporting us physically to another place, the wheel, steam trains, flight. Even modern telecommunications fit into that bracket. The telephone or the video link transport us to a shared virtual place with other people. Virtual worlds are, as I may have mentioned a few times before, ways to enhance the experience of humans interacting with other humans and with interesting concepts and ideas. That experience, up to know has been a tethered one. We have evolved the last few decades becoming reliant on rectangular screens. Windows on the world, showing us text, images, video and virtual environments. Those screens have in evolved. We had large bulky cathode ray tubes, LED, Plasma, OLED and various flat wall projectors. The screens have always remained a frame, a fixed size tethering us to a more tunnel vision version. The screen is a funnel through which elements are directed at us. We started to the untethering process with wi-fi and mobile communications. Laptops, tablets and smartphones gave us the ability to take that funnel, a focused view of a world with us. More recent developments have led to the VR headsets. An attempt to provide an experience that completely immerses us by providing a single screen for each eye. It is a specific medium for many yet to be invented experiences. It does though tether us further. It removes the world. That is not to say the Oculus Rift, Morpheus and HTC Vive are not important steps but they are half the story of untethering the human race. Forget the bulk and the weight, we are good at making things smaller and lighter as we have seen with the mobile telephone. The pure injection of something into our eyes and eyes via a blinkering system feels, and is, more tethering. It is good at the second affordance of transporting is to places with others, and it is where virtual world and the VR headsets naturally and obviously co-exist. The real revolution comes from full blended reality and realities. That plural is important. 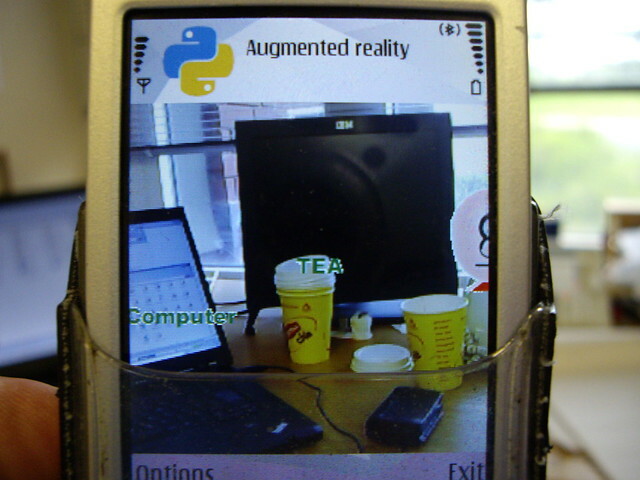 We have had magic lens and magic mirror Augmented Reality for a while. Marker based and markerless ways to use one of these screens that we carry around or have fixed in out living rooms to show us digital representations of things places in out environment. They are always fun. However they are almost always just another screen in our screens. Being able to see feel and hear things in our physical environment wherever we are in the world and have them form part of that environment truly untethers us. Augmented Reality is not new of course. We, as in the tech community, has been tinkering with it for years. Even this mini example on my old Nokia N95 back in 2008 starts to hint at the direction of travel. The devices used to do this are obviously starting at a basic level. Though we have the AR headsets of Microsoft Hololens, Google’s Magic Leap to start pushing the boundaries. They will not be the final result of this massive change. With an internet of things world, with the physical world instrumented and producing data, with large cloud servers offering compute power at the end of an wireless connection to analyse that data and to be able to visualize and interact with things in our physical environment we have a lot to discover and to explore. I mentioned realities, not just reality. There is no reason to only have augmentation into a physical world. After all if you are immersed in a game environment or a virtual world you may actually choose, because you can, to shut out the world, to draw the digital curtains and explore. However, just as when you are engaged in any activity anywhere, things come to you in context. You need to be able to interact with other environments from which ever one you happen to be in. Take an example, using Microsoft Hololens, Minecraft and Skype. In todays world you would have minecraft on you laptop/console/phone be digging around, building sharing the space with others. Skype call comes in from someone you want to talk to. You window away from Minecraft and focus on Skype. It is all very tethered. In a blended reality, as Hololens has shown you can have Minecraft on the rug in front of you and skype hanging on the wall next to the real clock. Things and data placed in the physical environment in a way that works for you and for them. However you may want to be more totally immersed in Minecraft and go full VR. If something can make a small hole in the real world for the experience, then it can surely make an all encompassing hole, thus providing you with only Minecraft. Yet, if it can place Skype on your real wall, then it can now place it on your virtual walls and bring that along with you. This is very much a combination that is going to happen. It is not binary to be either in VR or not, in AR or not. It is either, both or neither. It is noticeable that Facebook, who bought heavily into Oculus Rift have purchased Surreal Vision last month who specialize in using instrumentation and scanning kit to make sense of the physical world and place digital data in that world. Up until now Oculus Rift, which has really led the VR charge since its kickstarter (yes I backed that one!) has been focussed on the blinkered version of VR. This purchase shows the intent to go for a blended approach. Obviously this is needed as otherwise Magic Leap and Hololens will quickly eat into the Rifts place in the world. So three of the worlds largest companies, Facebook, Google and Microsoft have significant plays in blended reality and the “face race” as it is sometimes called to get headsets on us. Sony have Project Morpheus which is generally just VR, yet Sony have had AR applications for many years with PS Move. So here it is. We are getting increasingly more accurate ways to map the world into data, we have world producing IOT data streams, we have ever increasing ubiquitous networks and we have devices that know where they are, what direction they are facing. We have high power backend servers that can make sense of our speech and of context. On top of that we have free roaming devices to feed and overlay information to us, yes a little bit bulky and clunky but that will change. We are almost completely untethered. Wherever we are we can experience whatever we need or want, we can, in the future blend that with more than one experience. We can introduce others to our point of view or keep our point of view private. We can fully immerse or just augment, or augment our full immersion. WE can also make the virtual real with 3d printing! That is truly exciting and amazing isn’t it? It makes this sort of thing in Second Life seem an age away, but it is the underpinning for me and many others. Even in this old picture of the initial Wimbledon build in 2006 there is a cube hovering at the back. It is one of Jessica Qin’s virtual world virtual reality cubes. That cube and other things like it provided an inspiration for this sort of multiple level augmentation of reality. It was constrained by the tethered screen but was, and still is, remarkable influential. Here my Second Life avatar, so my view of a virtual world is inside 3d effect that provides a view, a curved 3d view not just a picture, or something else. It is like the avatar is wearing a virtual Oculus rift it that helps get the idea across. This is from 2008 by way of a quick example of the fact even then it could work. The last few months have been a little bit unusual, or maybe just part of the general flow of business and life depending how you look at it. Having an independent limited company, with just one employee (me) leads to the inevitable feast and famine of projects. Without a product, as such, there is no sustainable revenue stream. Just expertise. That might be advice and consulting, helping people along a path, or it may be diving in and join the fight developing something. My two main paying long term projects appear to have tapered off. One due to some international malarkey with a 3rd party and the other due to an organisations reorganisation of who doe what where. As an ad hoc provider you are the end of the chain and so just have to take it as a risk of the business. The thing with long term projects is that you have to offer a degree of loyalty. Some things just take time and that may not mean getting paid. Its a gamble. In this case both gambles have not paid off it would seem. Don’t get me wrong both bits of work have been fantastic opportunities to build interesting virtual world spaces and do the full stack and lots of overall design and direction. Things just happen. My other startup investment work, despite being an amazingly cool idea has not managed to get the sort of investment it needs (yet). The “yet” is important as its not worth throwing the towel in when you know it’s revolutionary. I am used to doing things before their time that people don’t quite understand yet. We got quite a long way with a very promising investor a year or so ago but that didn’t work out. So we are back pitching, hustling, trying to showcase and inspire people to get it. As a professional evangelist I know that it is hard work getting adoption of the new. Yet we still plough on. So that leaves the day to day stuff. Getting new projects, new leads, new contracts or even a new full time/part time traditional job role. Everything I have ever done has been based on people either knowing me, knowing my work, knowing someone who knows someone. It is why the virtual world space has been so influential in my life, it was being able to expand on who knew who and working directly with people at a more direct creative level that makes it engaging. Now, though, despite having an extensive web presence, this blog and my previous ones go back years, having a TV show reel, having writing and speaking portfolios I find that I am having to fall back on the traditional CV or resume to send out and hope it conveys enough of the breadth and depth of this particular strange profile I and my company has. Reputation is everything, so it seems strange to have recruitment firms look at my CV and just pattern match on particular keywords. I have experience of that not being so great when I was helping us ramp up with software contractors back in the 1999. We did indeed get a CV through from our filtering recruitment consultant needing a Lotus Domino programmer, but had someone who had worked at Domino pizza. Being a generalist/full stack developer/architect/evangelist and with a long experience in all elements of the tech industry and across other industries my CV often has the keywords in it. It does have the explanation and the more interesting wording around the job of an evangelist and of a technology innovator, but that gets lost in the filtering. I was asked by one recruiter if I knew Agile. I pointed out that back before the agile manifesto we were doing interactive development with flat structures in the early days of the web as there was in fact no other sensible way to do it. We battled the waterfall traditional approach. Stuff like that you can’t put in a CV it is for a conversation, otherwise, as it did just then, it sounds arrogant. I had another look at upwork recently too, just for a little quick contract, and to see how it works. However it is full of “can you just rebuild world of warcraft for me for $200, must show reference examples”. That got be worrying that all my reference work has actually been rather closed off. The startup work is trying to gain funding, so its not like we open source everything or put the code on github. It covers everything, unity3d, c#, opensim, php, mysql, linux, Facebook, twitter, drupal etc. It is a pat pending concept too. Yet I can’t just show that to anyone. My research work has been behind closed doors, some of it completely secret, again the end product can sort of be demonstrated in one case, but the other with it’s complexity is not a look at this project though I do try and allude to its content. So have I painted myself into a dead end? I don’t think so. I have gained a lot of experience in many things over the years. I have applied myself to technical and non technical roles. I even learned to custard pie people in the face on TV. That is what a generalist does. It is a skill to be able to adjust and go with the flow, to excel in new things. I admire specialists, I envy them sometimes. They have a defined focus, that have a specific role in life. Mine is to do lots of things and share them with lots of people. So if you are reading this and sharing the ups and downs helps, or if you are a kindred spirit or even if you are an intelligent head hunter, or potential partner/customer who wants to have an interesting conversation and explore the world then please get in contact. Of course my CV is available on request 🙂 Meanwhile I will be applying some martial arts unbreakable spirit and getting on with the future. It has been quite a busy week with it being half term and Predlet 1.0 12th birthday. It started with an experience that I was not totally looking forward too. This experience was a haptic fear generating simulation using a real world physics engine, or climbing trees as you may want to call it. 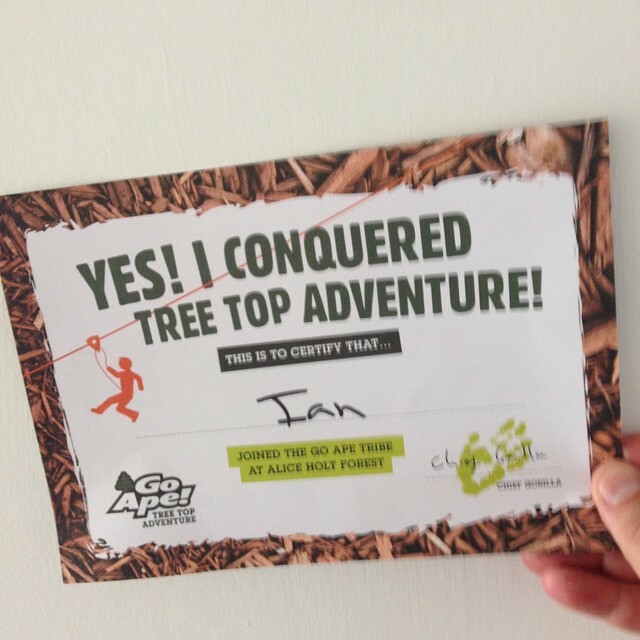 Predlet 1.0 has wanted, for some time, to go to Go Ape. 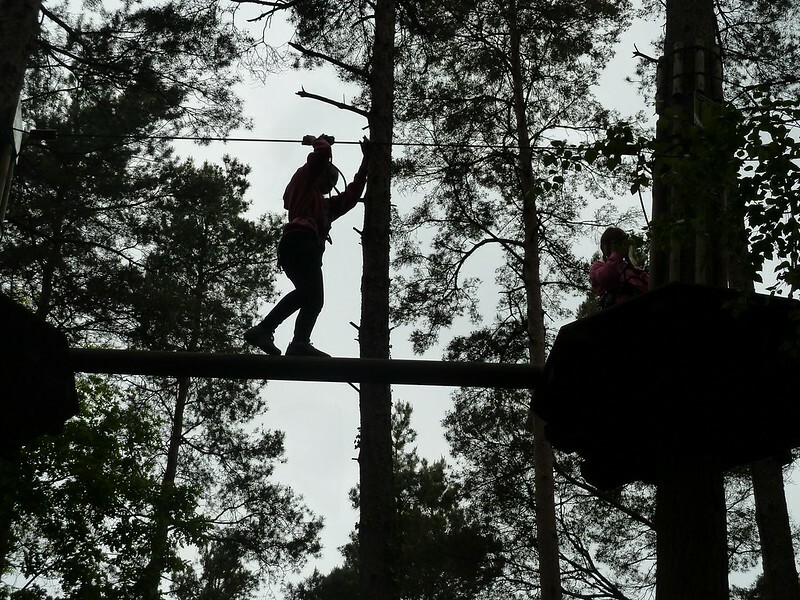 This is a treetop adventure that involves being 30+ feet up in the trees walking across precarious platforms, making leaps of faith and taking zip lines. As this is quite a potentially dangerous endeavour any of the “Baboons” (under 16’s) need to be accompanied by a responsible Gorilla. I was volunteered to be that Gorilla. I am not really a climber, speed and zooming around, or ground based activities are more my thing. The whole thing is really very safe, as long as you do it correctly. You are provided with a harness containing 2 carabiner’s on one short and one slightly longer rope. You also have a hook over pulley that is used almost all the time. You are trained on the ground to always hook on, to ensure you do things in the right order. Then you get to practice on a set of equipment that is only 3 feet from the ground. There are only really a few points to consider. Before you know it you are ascending the first wobbly rope ladder (attached to you harness and your safety ropes and counterweighted). Like all good experiences it leads you along. I had the extra concerns of making sure both Predlet 1.0 and her friend were taking care and doing things right, they had to go first and I had to follow. Clambering up was a bit awkward, and the focus of clicking on and off with the carabiners was fairly intense. After all being 30 feet up and not attached, which it is quite possible to do as you transition does focus the mind. I was not feeling that great shuffling along. You have to attach the rollers to the overhead parallel cable, one carabiner to it and the other just over the wire. To start with everything feels loose. Yes you have a harness, yes 3 ropes in total are attached. However you have to hang on. If you fall you go no more than a few inches in reality as the ropes are only just slack. The feeling though, and the height is very real. So you cling on and shuffle across these various obstacles. However there are other types of obstacle, you encounter one very early on. The Tarzan swing. There us a cargo net suspended across from a completely open gap. So you have to clip on to rope and just jump off to swing across. This is where it got a little counter intuitive and why I am writing this. Once attached I looked at the drop, I had the rope attached and I sat a little and felt the harness working. So I just jumped. It was a lot easier to just trust the technology and actually need it than the other obstacles that the technology was a backup. So this got me thinking, albeit afterwards I was a bit more focussed at the time, that often we spend time and effort clinging to things and in particular one type of technology to get us through. We sort of know there is a backup but the old way works so lets keep shuffling. In this example there were things like the ends of logs forming a bridge. The pulley and cable acted as the support, but the aim was with tip toe across the gap on the older technology of the log. I know some people would have been fine with it but trying to relax, knowing from martial arts that that is the best thing to have good body control, is countered by the tension of hanging on, gripping what you can. At the end of these there was a sense of relief at having made it to the next stand. So it was goal to goal, hanging on, not wanting to use or need the harness and ropes. At the end of each section there was another leap of faith involving a zip line. Unlike the tarzan swing this few seconds of hurtling towards the ground gave you a chance to feel what was happening. 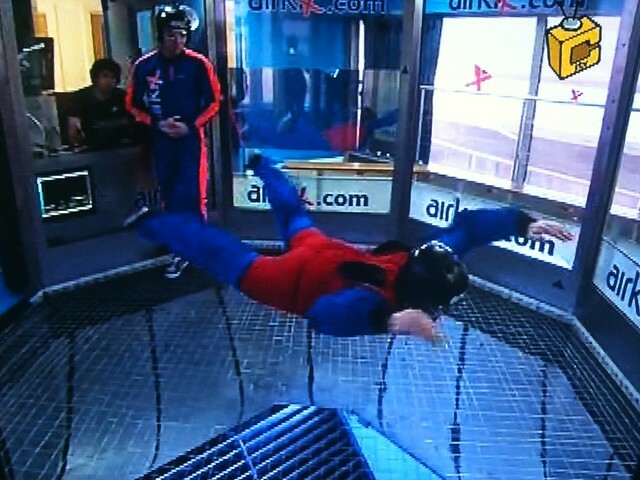 There was enough time to consider your elegant landing, or in my case crash landing. I felt quite happy to brace myself and plough into the pile of chipped bark at high speed. Again just trusting in the technology to carry me, there is no backup. So I am guessing I am a leaper not a shuffler. I think the tech evangelist personality type has to be. I think we also spend a lot of time crashing at the end of zip lines too. Also though it is important to do the shuffling, to do the hanging on in there with the old tech in order to feel what others feel and be able to help them find that innovative leap of faith that will bring so much benefit. Anyway, it was quite fun without all this extra layering of though process. More importantly the girls enjoyed it a lot and found it funny that I had to be up there with them.